Ancient Aztec warriors relied on this mighty seed to ready them for battle. 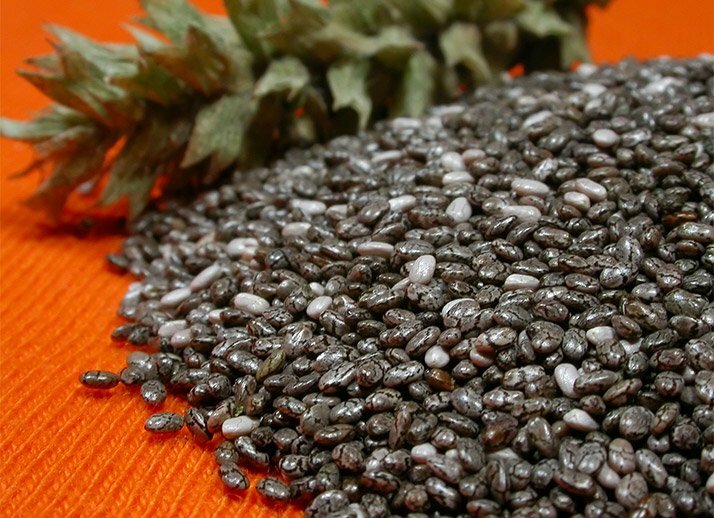 Besides wanting to be cool like an Aztec, here are 5 more reasons to eat chia seeds! The idea of "nutrient density" in foods is catching fire these days, and with good reason. After all, why wouldn't you want to prioritize foods that will provide you with the most nutritional bang for your buck? If you load up your diet with dishes that overdeliver, you'll be flooding your body with what it needs to perform and look its best. So allow me to put together a sales pitch for a tiny seed with a seriously impressive nutritional resume. The chia seed is most famous—or infamous—for being hawked as a novelty product to the tune of "Ch-ch-ch-chia!," but long before, chia seeds were a superfood prized by the ancient Aztec armies. In recent years, the seeds of the Salvia hispanica plant native to Mexico are experiencing a renaissance as a bona fide functional food. And unlike some flash-in-the-pan foods, chia lives up to the hype. Here are some science-backed reasons why you should jump on the chia bandwagon, along with a simple, nutrient-packed chia recipe from my new book, "Rocket Fuel Foods"! Chia seeds are also laden with disease-fighting antioxidants, those much-ballyhooed compounds that roam the body looking for cell-damaging free radicals to knock out.6 Of course, no antioxidant can eliminate all free radicals, but in trying to do so, antioxidants are thought to also help reduce the risk for a number of chronic diseases.7 Since intense exercise can accelerate the production of free radicals, upping your intake of antioxidant-rich edibles like chia could theoretically improve recovery for better fitness gains. It's no secret that protein is crucial to your performance and recovery. And for a miniscule tablespoon of these seeds, you can have 3 grams of complete protein—yes, you read that right! It's got all nine essential amino acids, and while you're not going to meet your daily intake with seeds alone, they can definitely help boost the total, particularly if you're prioritizing vegetarian sources. 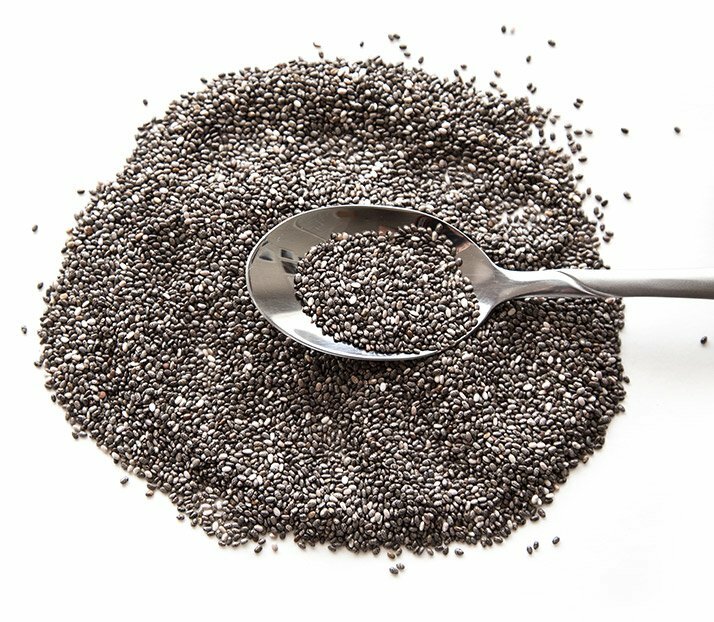 There are few foods that can stand with chia with respect to the plant-based omega-3 fatty acid alpha-linolenic acid (ALA). While ALA is not as powerful in its health-hiking potential as the longer-chain omega fats present in fatty fish like salmon, it's still a powerful addition to your diet with plenty of benefits. Chia seeds are an excellent source of important minerals, such as iron and calcium, but also magnesium (23 and 31 percent of daily recommendation for females and males) and manganese (30 percent of your daily recommendation). You're likely well-versed in the benefits of the former two, but you may be surprised to know how much of an impact manganese and magnesium each has on your gym performance. Manganese plays a critical role in blood-sugar control, protein and carbohydrate metabolism, and particularly in the production and activation of the enzymes responsible for carrying out gluconeogenesis.16 Gluconeogenesis is the production of glucose from noncarbohydrate sources. This method of producing fuel becomes increasingly important the longer your exercise sessions last, as you deplete your circulating and stored glucose (glycogen) levels. Ready to give these power-packed seeds a try, but not sure where to start? 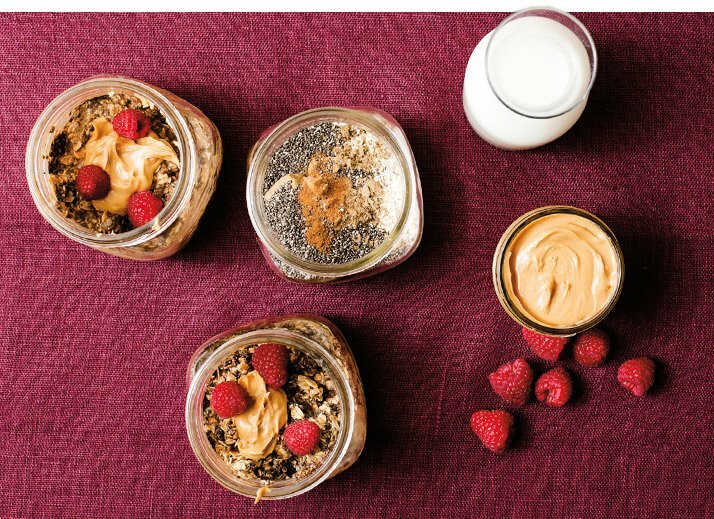 Grab a mason jar and whip up my PB & Berry Protein Oats! Chia seeds are often added to overnight oat recipes, since they do a great job of soaking up excess liquid to keep the mixture from being soggy. The end result here is a dish that proves breakfast is great at any time of day. These make-ahead gussied-up oats are ready to help you recover the minute your workout comes to a halt. Soaking the oats removes the need to cook them, making this recipe a great option for transporting with you if you're going to be away from the kitchen after exercise and you don't want to delay refueling. The recipe can also be easily altered if you're dairy-free, gluten-free, vegan, or vegetarian. Use oats labeled "gluten-free," or try spelt, kamut, or quinoa flakes instead of oats. Replace protein powder with 1/4-cup Greek yogurt, and decrease milk to 1/2-cup. To make dairy-free, use a plant-based protein powder and nondairy milk. Try topped with strawberries or blackberries instead of raspberries. Republished with permission of VeloPress from "Rocket Fuel: Power-Packed Food for Sports and Adventure" by Matt Kadey, RD. See more recipes at rocketfuelfoods.net. Buil-Cosiales, P., Zazpe, I., Toledo, E., Corella, D., Salas-Salvadó, J., Diez-Espino, J., ... & Fiol, M. (2014). Fiber intake and all-cause mortality in the Prevención con Dieta Mediterránea (PREDIMED) study. The American Journal of Clinical Nutrition, 100(6), 1498-1507. Giacco, R., Parillo, M., Rivellese, A. A., Lasorella, G., Giacco, A., D'Episcopo, L., & Riccardi, G. (2000). Long-term dietary treatment with increased amounts of fiber-rich low-glycemic index natural foods improves blood glucose control and reduces the number of hypoglycemic events in type 1 diabetic patients. Diabetes Care, 23(10), 1461-1466. Brown, L., Rosner, B., Willett, W. W., & Sacks, F. M. (1999). Cholesterol-lowering effects of dietary fiber: a meta-analysis. The American Journal of Clinical Nutrition, 69(1), 30-42. Martínez-Cruz, O., & Paredes-López, O. (2014). Phytochemical profile and nutraceutical potential of chia seeds (Salvia hispanica L.) by ultra high performance liquid chromatography. Journal of Chromatography A, 1346, 43-48. Willcox, J. K., Ash, S. L., & Catignani, G. L. (2004). Antioxidants and prevention of chronic disease. Critical Reviews in Food Science and Nutrition, 44(4), 275-295. Heskey, C. E., Jaceldo-Siegl, K., Sabaté, J., Fraser, G., & Rajaram, S. (2016). Adipose tissue alpha-linolenic acid is inversely associated with insulin resistance in adults. The American Journal of Clinical Nutrition, 103(4), 1105-1110. Reaven, G. M. (1988). Role of insulin resistance in human disease. Diabetes, 37(12), 1595-1607. Seidell, J. C. (2000). Obesity, insulin resistance and diabetes—a worldwide epidemic. British Journal of Nutrition, 83(S1), S5-S8. Ho, H., Lee, A. S., Jovanovski, E., Jenkins, A. L., Desouza, R., & Vuksan, V. (2013). Effect of whole and ground Salba seeds (Salvia Hispanica L.) on postprandial glycemia in healthy volunteers: a randomized controlled, dose-response trial. European Journal of Clinical Nutrition, 67(7), 786-788. Vuksan, V., Jenkins, A. L., Dias, A. G., Lee, A. S., Jovanovski, E., Rogovik, A. L., & Hanna, A. (2010). Reduction in postprandial glucose excursion and prolongation of satiety: possible explanation of the long-term effects of whole grain Salba (Salvia hispanica L.). European Journal of Clinical Nutrition, 64(4), 436-438. Jahnen-Dechent, W., & Ketteler, M. (2012). Magnesium basics. Clinical Kidney Journal, 5(Suppl 1), I3-I14. Brilla, L. R., & Haley, T. F. (1992). Effect of magnesium supplementation on strength training in humans. Journal of the American College of Nutrition, 11(3), 326-329. Abbasi, B., Kimiagar, M., Sadeghniiat, K., Shirazi, M. M., Hedayati, M., & Rashidkhani, B. (2012). The effect of magnesium supplementation on primary insomnia in elderly: a double blind placebo-controlled clinical trial. Journal of Research in Medical Sciences, 17(12), 1161-1169. Micronutrient Information Center: Manganese (2016).